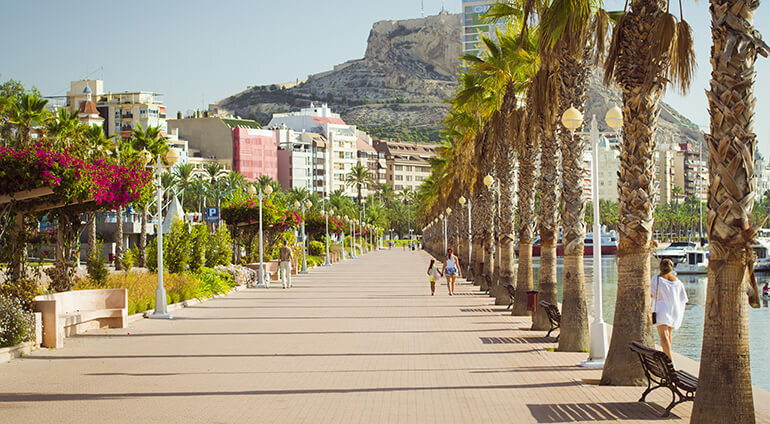 For many, life in Alicante centres around eating and drinking and the city has an excellent selection of restaurants and nightlife. It’s customary to have a hearty meal in the early afternoon, followed by a siesta, with many restaurants closing between 4pm and 9pm before reopening for dinner. Some of Spain's best paella is served in Alicante, so be sure to sample the local version of this rice and seafood dish. Another local delicacy is Denia prawns, bright red crustaceans which often come with a hefty price tag and are most cost-effectively experienced as part of a tapas meal. The city’s nightlife is an all-night affair and centres around the Old Town, known as El Barrio or El Casco Antiguo, where you’ll find dozens of bars and clubs and the eastern rim of the marina, called Puerto, in and around the casino.